Does A Change In Fence Style Require Planning Permission? Curb appeal tends to be a homeowner buzzword that gets bandied about, but what does curb appeal actually mean? Simply put, curb appeal is how appealing your home looks from the outside, i.e the curb. Curb appeal not only plays a role when entertaining guests during garden parties or barbeques, but is also very important when you decide to sell your home. Consider it this way, most people, whether they be guests or would be homebuyers, will see your more often than not see your home at night. Having the right outdoor lighting can help to highlight the more impressive features of your house that would otherwise be lost in the dark. Outdoor lighting can also help to improve both the safety and security of your home, which is all the more reason to consider it. There are few things more appealing to a would be vandal or home invader than the cover of darkness. A dark home suggests that no one is home, making for an all to appealing target. 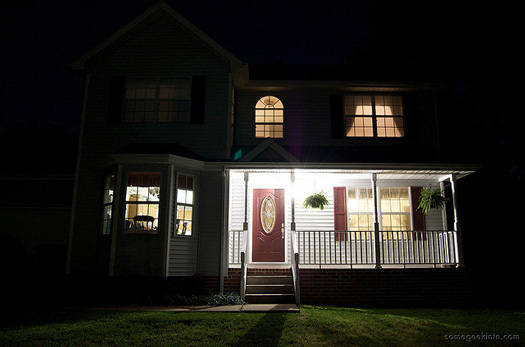 With a little outdoor lighting, your home becomes more visible and a less desirable target. Even from a general safety standpoint, having some extra lights around your home removes tripping and fall hazards that wouldn’t be seen otherwise. If you enjoy having guests and parties over, outdoor lighting is a must. With a few well placed lights, you and your guests can enjoy the outdoors even when the sun goes down. Allowing you to enjoy a balmy summer evening, without having to stumble around in the dark, or dealing with inconsistencies and shadows of flickering firelight. A little outdoor lighting also goes a long way in helping to make your house more visible when your guests are trying to find it. Remember, first impressions make a world of difference. If your home has low curb appeal, you’re going to have a harder time finding a buyer. Outdoor lighting helps to highlight your home in the evening and is an easy way to make your home seem more inviting. This goes a long way when it’s time to sell your home. A common concern about outdoor lighting is that it will drive up your electric bill. This isn’t always the case. Security lights that are operated by motion control, makes your home safer and more secure, but it also means they only come on when necessary. Solar lights are readily available and add a charming glow to walkways and porches. For bigger lights, consider putting them on a timer, that way you don’t have to remember to turn them on, or off. It doesn’t take much to spruce up your home and boost your curb appeal, especially if you’re looking to sell. If you’re having difficulty finding a buyer, take a walk outside your house in the evening. Sometimes a little curbside perspective is all you need to shed some light on the problem.